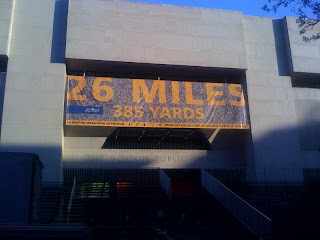 The Beantown Bloggery: Good Luck To The Marathoners! Just wanted to say Good Luck to everyone who's running in the marathon today. I guess it's already started by now, unfortunately I'm trapped at work. All of my clients are outside of MA, so they don't take today off. At first I was telling myself, maybe one day I'll run this. But then yesterday I did my usual 3 mile run and was in enough pain that I'm not sure i could ever do 9x more than that. 0 Response to "Good Luck To The Marathoners!"